I have been busy harvesting my willow and dogwood. The quality is much better this year as I managed to treat the infestation of giant willow aphids sucking on the willow with a couple of pyrethrum treatments over summer. Weaving objects out of natural materials is a natural accompaniment to gardening, growing your own food and enjoying the natural world. What is better than gathering your own home grown vegetables in a basket you made from plants from your garden or neighbourhood? A craft that dates back to the beginning of civilization, born out of need and yet each style unique to each culture. The materials, born out of nature are gathered; roots (earth) leaves (water), flowers (air) and fruits (fire) are gathered at their peak and stored ready to create objects that are both practical and beautiful. Each material has its own properties which leads it s use in various creative directions. There are many techniques to explore and develop from a simple container to fences or sculptures and everything in-between. Weaving with natural materials can create interesting fences, screens and garden art. 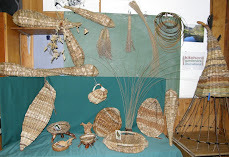 Basketry may be considered a technique that transforms nature into material culture.